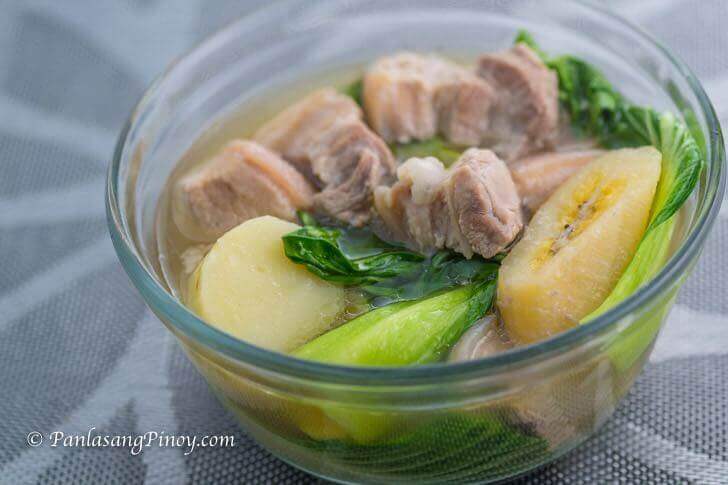 Pork Nilaga is a type of Filipino pork soup in clear broth. I used pork belly in this version along with other ingredients such as potato, saba banana, and pechay (or baby bok choy). It is a perfect dish that you can enjoy during cold and rainy weather. In this nilaga version, I added Knorr Pork Cube to provide more flavor to the dish. I suggest that you serve this hot with a small bowl or saucer of fish sauce (with chili pepper if you prefer it a bit spicy) on the side. Pork Nilaga is one of those dishes that I tried to cook when I was starting out. My mom makes this almost regularly on a rainy day. I was able to observe how she does every step. It seemed effortless, so I thought of giving it a try. I am my mom’s go to person when it comes to buying ingredients. She would ask me to buy ingredients for a certain dish that she plans to cook for a particular day. We lived in a subdivision where there are stalls of fruits, vegetables, and meat located near the entrance gate. This is a place where everyone in the neighborhood refer to as “kanto”. I have been going back and forth “sa kanto” almost everyday to buy her ingredients, there came a time when she would just tell me the dish that she will make and I knew exactly what to get her. One day, she asked me to buy ingredients for pork nilaga. Being the obedient son that I was, I complied instantly. When I got home, I told her to sit back and relax while I cook for her. She thought that I was joking at first, but she eventually let me do the cooking. Now, it’s time for you to do the cooking. Try this Pork Nilaga Recipe. Let me know what you think. This is a recipe for Pork Nilaga. It is a type of soup in clear broth. Add onion and whole peppercorn. Continue to boil until the onion becomes tender. Put the pork belly into the cooking pot. Let the water re-boil. Add the pork cube. Stir. Cover the pot and continue to cook in low heat for 45 to 60 minutes or until the pork gets tender. Add potato and saba banana. Cook for 5 to 7 minutes. Add the fish sauce and pechay or bok choy. Stir. Cook for 3 to 5 minutes. Just like you to know that you are a big help for people like me that has no experience in cooking and located outside the Philippines. Your videos and directions are easy to follow and your voice is very clear. It is very nice also that you are using alternatives like spinach and others. I have try recipes from other sites but cannot deliver the good results that I’m getting from your recipe so I have stick only your recipes. 1. For pork nilaga, Can I used cabbage instead of bok choy? 2. Pag alam ko na ba yung quantity ng asin at paminta sa recipes pwedeng hindi ko na ilagay sa huli? I mean ilagay ko sa mid part? Sherwin -- Thank you for the feedback. 1. Yes, you can use cabbage instead of bok choy. It can be regular cabbage, Napa cabbage (pechay Baguio), or savoy cabbage. 2. Yes, you can add salt and pepper in the middle of the cooking process, but I suggest to add salt (at least) at the end. Ground black pepper can be added even in the beginning. Hi kabayan! Thanks s recipe. Eto ang dinner namin mamaya. Gustong gusto ko yung paraan mo sa pagbibigay ng instructions simple pero malinaw.